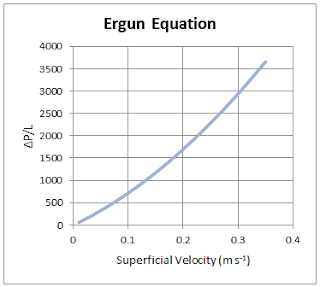 This Excel spreadsheet helps you calculate the pressure drop through packed and fluidizeds bed with the Ergun equation. In 1952, Sabri Ergun derived the following equation to predict the pressure drop in packed beds. By comparing the pressure drop given by the Ergun equation to the pressure drop for minimum fluidization, you can calculate the superficial velocity necessary for fluidization. At this point, bubbles of gas form and rise through the bed. This increases the effective volume of the bed.